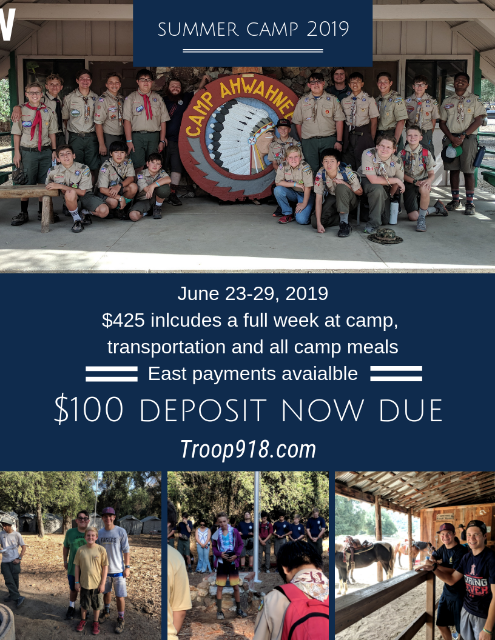 Troop 918 is sponsored by Saddleback Church in Lake Forest, California. Our goal is to develop Godly young men of great character with a heart of service for others and knowledge and respect for the outdoors. Camporee will take place at Irvine Lake on Fri-Sun April 26th-28th. Show off your Scout Skills in the patrol based competitions against patrols from all over the district... Earn Top Troop, Troop Patrol & Honor Troop awards. Points awarded for Campsite inspections so keep it clean and well put together! Compete in the Dutch-oven cooking competition for both Scouts and Adults. If you remember, WE WON BIG two years ago at the Dutch oven cook-off! Bring a few dollars for the snack shack and Mr. Iverson's World Famous Scout Gear Trading Post! Plus, This is the event with the Order of the Arrow call out. Were you on the ballot for our Troop this year? Come find out the election results! Did you get selected to join the Order Of The Arrow??? The cost for this event is $40 each. Registration is due by Monday 4/15... just like taxes! We'll return Sunday around or before lunchtime. Make sure to sign up for our Troop texting to get the "We're on our way" message. 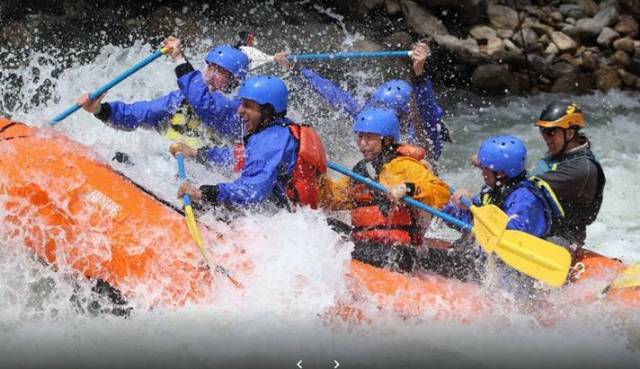 Scouts, we have our Whitewater rafting trip coming up on May 24-27 (Memorial Day Weekend). We will be leaving on Friday afternoon as soon as possible with school and work schedules and returning on Monday the 27th. We are still working on the weekend plans but will be kayaking or hiking in Sequoia National Park on Saturday and Whitewater rafting all day on Sunday. This an amazing opportunity to get out on the river and experience both six-man rafts and two-man kayak. The river water level should be terrific and make for a really fun trip. We will also be offering the Whitewater Merit Badge for those that would like to get it. What’s the best part? The Troop has graciously agreed to subsidize a portion of the costs so the full 4 day weekend with transportation, food, rafting provided through a professional outfitter, wetsuits, kayaking/hiking, etc. 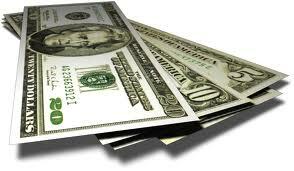 is only $150.00 per person. For anyone who has done this before, this is an incredible opportunity! This is only possible through the Troop 918 Scout fundraising efforts so go out and sell those Adventure Cards and sign up to support the Troop 918 Merit Badge Day in June so this type of Troop support is available for future events! With this being the busy holiday weekend, we have limited space at the campsite and with the rafting outfitter so please sign up asap. It is first come first serve on the trip. Depending on the number of scouts interested in attending, we will attempt to increase our reservation, if possible. All adults are welcome but we will be prioritizing attendance with the Scouts and adult drivers needed. Our Scouts who have attended Lost Valley have had a great time and experienced personal growth opportunities available at no other place but Boy Scout summer camp! You'll never forget your summer at Schoepe Scout Reservation at Lost Valley. With programs designed for maximum fun and achievement, this camp offers once-in-a-lifetime adventures for a pure Scouting experience. Tackle some Merit Badge requirements at the nature/STEM center, field sports, handicraft or shooting sports ranges. Take on adventure challenges like ATV riding, climbing & rappelling, mountain biking, zip lining, and horseback riding. Campfires, movie nights, Vespers, and camp-wide games are all a part of the experience at Lost Valley. Getting Lost has never been so much fun! Dates: June 23-29, 2019 (Sun-Sat) Before most school sports camps! Troop 918 has a policy that no Scout should stay home due to finances. We have been blessed with the ability to assist where there is a need. If this would make a difference in your Scout participating, we want to discreetly help. Please contact our any of the following people: Scoutmaster Mike Karn, Committee Chair Simon Akhaven or Acitivites Chair, ASM Dave Klein. 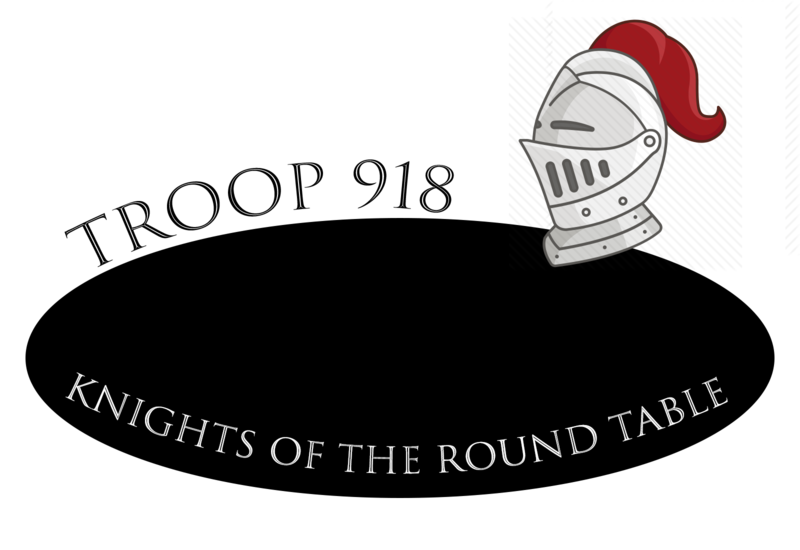 This month we have an EXTRA Troop meeting on Monday, March 25th, the last Monday of the month. Meal planning will also be done this night. Order of the Arrow and Troop Leadership Elections are this month.